Use solar-electric power for water lift or pressurizing from shallow water sources. Solar Force Piston Pump draws water from a shallow well, spring, pond, river or tank. It can push water uphill and over long distances for home, village, irrigation or livestock uses. It can use power directly from a photo-voltaic array, or from storage batteries, to fill a storage tank or to pressurize water. Pressurizing Application: DC version is most efficient. 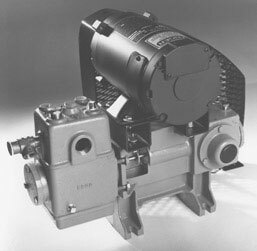 AC version uses a low-surge PM motor that greatly reduces starting surge, inverter size, and wire size requirements (when compared to conventional AC pumps). Rugged and Reliable: Proven design with a 20–year life expectancy. Illustrated Instruction Manual makes it easy for anyone to install and service, with no previous experience.